An immersion into the archive reveals a submerged and hallucinatory world, Paper Maché, where human presence is suffocated by paper titans and demons. 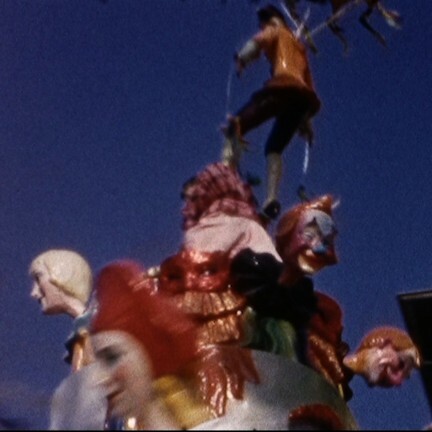 Shot in color between 1956 and 1967 with an 8mm camera by Bolognese cinematographer Alessandro Mantovani, images from Viareggio Carnival are made to reemerge (complete film stock conserved by Home Movies and reedited by Mirco Santi, Francesco Serra, Salvo Ridolfo e Michele Giovannini). From the imaginary potential of a bygone epoch that combined oneiric dimensions and traditions of the fairy tale, comes this live re-scripting which now involves the quartet In Zaire. The sonic interpretation of this startling carnival world is thus entrusted to variations by a composite and heterodox group of musicians. In Zaire is a psychedelic-tribal quartet involving members of the duo G.I. Joe, Claudio Rocchetti and Stefano Pilia, both of whom over the years have been part of the Netmage scene through a variety of projects (3/4HadBeenEliminated, OLYVETTY,…). Live, In Zaire take audiences on a trip, even though their music is not limited to the psychedelic. The quartet explore the paths of an involving dub-funk mix of rhythm and black-influenced tribal percussion, with electro-indian melodies and bass, arab-psychedelic voice and introspective, minimal ascendence. Home Movies, the national archive of family films, coordinates and curates, among other research activities, conservation and restoration, the direction and editing of numerous video installations and family film anthologies accompanied by performances from electroacoustic musicians. Among their various audiovisual projects and works in progress based on the re-use of archival images are Catherine, Circo Togni Home Movies, and Stilllivingrooms. Paper Mache comes from the collaboration between Mirco Santi, Francesco Serra, Salvo Ridolfo and Michele Giovannini. Mirco Santi, co-founder of Home Movies, lives and works in Bologna and works in collaboration with the cinema restoration laboratory La Camera Ottica. He produces films using recycled amateur film material, curating the direction and editing of video installations and family film anthologies accompanied by performances from electroacoustic musicians, and was first included in Netmage 02. Francesco Serra, guitarist and self-taught composer, lives and works in Bologna. The audio/video project he conceived, Trees Of Mint, has continued for the last ten years. He collaborates with Home Movies where he focuses on live performances and soundtracks for amateur films in substandard formats. Salvo Ridolfo lives and works in Bologna. He has played as a drummer-percussionist in a variety of music projects including Painting Void and Trees Of Mint. Currently he is involved in a solo project involving electronics and sonic experimentation. Michele Giovannini, architect, lives in Bologna and is one of the brains behind Homework, a bolognese collective, a point of reference in Italy for digital auto-productions. His alter-ego Micamat is concerned with musical architectures in equilibrium between noise, ambient and, in 2010, in collaboration con Homemovies, the live sound accompaniment to Homework Music 4 Homemade Movies at the Dancity Festival.